CLICK HERE for international distributors list and contact details. SHELLAWAX is manufactured using our own specially formulated Hard Shellac as a base which gives a hard, durable finish, with resistance to marks and blemishes from water, alcohol and heat. The hardener in the polish is activated by the heat generated during the application of the Shellawax. As soon as the surface is dry (almost instantly) a cross-linking begins in the finish. It is this cross-linking process which creates the hard surface. It takes around 3 weeks for the entire process to complete. However, in the mean time the work can be handled and used without fear of upsetting the process. Just keep it away from alcohol, water, etc during this time. 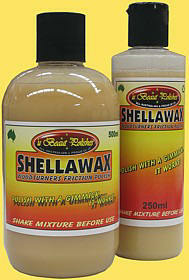 TShellawax is a foolproof, one application, friction polish, made for use on the wood lathe. It is (to our knowledge) the fastest and easiest to use polish of its kind on the market today, giving an instant shine to all timbers. It is used with the lathe running and under heat, created through friction, it is fused into the timber. It dries instantly, and can be handled immediately after application. It is water resistant from the start and becomes more resistant to water, alcohol, etc, over a 3 week period after initial application. Shellawax is a non toxic finish. The ingredients used in Shellawax can be found in food, confectionery, pharmaceuticals, cosmetics, etc. NOTE: In its liquid form Shellawax contains ethanol (pure alcohol) & hydrocarbons making it flammable & poisonous. However as soon as it is applied these solvents evaporate leaving a 100% non toxic, non flammable finish both in & on the timber’s surface. Shellawax is a complete finish designed to be applied directly to the raw timber. This allows the Shellawax to bond with, and basically become part of the wood and not just another a surface coating. Before you use Shellawax it is advisable to put in some fine preparation work with abrasive paper. The finer you sand the better your finish will be. It is a waste of time and Shellawax applying it to timber that has been sanded with anything less than 320 grit. On most work use the following grit papers. 180, 240, 320, 400, 600 & finer if desired. On pens and other items that will be handled and closely inspected use 600, 800, 1000, 1200 and even finer if desired. Best results will always be obtained by sanding to 1200 grit and above. FOR SMALL SPINDLE WORK (under 10mm, (3/8") diam) Moisten a small section of clean soft cloth with Shellawax and apply directly to the work with the lathe spinning on high revs. Keep a heavy pressure on the work and slowly move the rag over the entire surface of the timber until you have attained a high shine. (approx. 15 seconds) If you are using very dry or porous timber you may need to apply the Shellawax with the lathe stopped then continue as above. FOR LARGE SPINDLE WORK: (up to 100mm (4”) diam) Stop the lathe moisten a clean piece of rag with Shellawax and quickly apply an even coat to the entire surface of the timber. Turn the lathe on, re-moisten the rag and continue as above using a constant, even, heavy pressure on the work with the damp section of rag. This heavy pressure generates the friction required to make the polish shine to its full extent. Subsequent coats can be applied immediately, if required. For a deeper more brilliant shine cut the surface lightly with 1200 grit abrasive then apply a second coat. With the lathe stopped, apply an even, heavy coat of Shellawax to the surface using a small section of rag (about the size of 20? piece) soaked with Shellawax. Turn lathe on and with the same dampened piece of cloth apply heavy pressure to the surface that has just been coated. Start at the centre of the piece and slowly work to the outside, maintaining a constant heavy pressure. Finish off with a few quick sweeps back and forth across the entire surface. Then a wipe with a clean soft rag. With bowls and larger spindle work you may get very fine lines in the surface, this is created by the weave in the rag & the speed with which the polish dries. To fix: cut the dry Shellawax with 1200 grit abrasive or our EEE-ULTRA SHINE then apply a second coat of Shellawax. A better solution for larger spindle work and bowls is to use our Shellawax Cream which has been developed especially for larger turned work, bowls, platters, etc. HAND RUBBING: Shellawax can be used to give a brilliant hand rubbed finish to small surfaces & items that cannot be spun in a lathe. 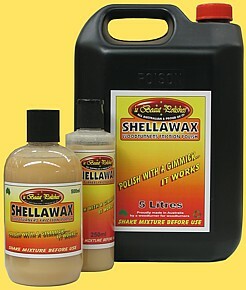 Shellawax can be mixed with Shellawax Cream as an extender. This allows for better use of these products on large turned work and for hand rubbed work. For bowls over (6”) 150mm diam, mix the Cream and Shellawax at the rate of approx 50/50 this will give you a runny cream that will stay on the surface longer and allow you more time to work it into the timber. Use different mixing rates for various jobs 20% Cream to 80% Shellawax for large platters etc up to 900mm (3’) diam and larger. Use Shellawax as a thinner for Shellawax Cream, which often thickens with use. This will also extend the life of the Cream. U-Beaut Polishes and their agents, accept no responsibility for problems arising from the use of Shellawax over: any oil, sanding sealer, oil or spirit based dye and stain, water based stain, pre-finish or any other finish - including, polyurethane, lacquer, varnish, French polish, etc. If you are not getting a brilliant finish Don’t blame the polish! Spray from applying Shellawax with the lathe running can make some floors very slippery. Shellawax can act as a stripper on some painted & polished surfaces. Wipe up spills immediately. If used with a brush or spray equipment clean immediately after use with Ethanol or brushes and equipment may be rendered useless if the Shellawax is allowed to dry. Keep away from: heat, sparks, fire, flame and other ignition sources. Avoid ingestion, contact with eyes, prolonged contact with skin or breathing of vapours.